Environmental managers are challenged to keep their docks cleared, continuously moving materials and wastes and maintaining an efficient flow of material. When we scratch the surface on what happens after, we learn some hard facts, particularly around recycling. There has been an 18 percent decrease in the number of facilities reporting they recycle clinical/medical plastics in the OR since 2014. There has been a 6 percent increase in facilities reporting they are tracking the weight of clinical/medical plastics recycled in the OR since 2014. From 2016 to 2017, the data shows a 31 percent increase in hospitals reporting they recycle urinals/bedpans in the OR as well as a 12 percent increase in the recycling of trays. There was a 10 percent decrease for those reporting recycling blue wrap as well as a 7 percent decrease in the recycling of overwraps from 2016 to 2017. Green teams are starting to focus on quality product rather than quantity, realizing more is not necessarily better. Make an appointment with recyclers and waste haulers and get the real story on the materials and what is working and what is not. Ask your member engagement manager for help in reconciling perception versus reality of health care plastics recycling for your region. Material and waste data tracking integrity continues to challenge many award applicants. While the 2016-released Less Food to Landfill Goal and Toolkit was not scored in 2017 Awards, it will be for the 2018 Environmental Excellence Awards. Join us at noon ET Nov. 9 for How to Track Food Waste Reduction. Hear from the EPA at 12:30 p.m. ET Nov. 14 on how to use their WARM tool to better communicate waste prevention and recycling’s environmental benefits. And join HPRC’s Peylina Chu and me at noon ET Nov. 29 for a repeat of our standing-room-only pre-conference event from CleanMed 2017, where we will get into the weeds with Andy Kragness of Gundersen, Angela Dalenberg and Glen Goodsell of Mayo Clinic, and Samantha McKeough of HealthPartners for, Health Care Plastics Recycling, It’s not all Rainbows and Unicorns. 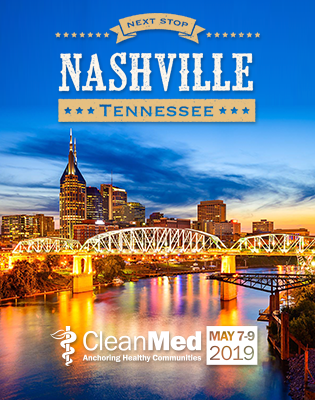 Hermine Levey Weston and I finished up our review of Material and Waste Submissions for CleanMed and are working diligently to come up with a good representation of emerging topics.